Brewer’s spineflower (Chorizanthe breweri) habitat. West Cuesta, San Luis Obispo County, July 4, 2011. Photo © 2011 Chris Winchell. Brewer’s spineflower (Chorizanthe breweri) growth habit, July 4, 2011. Photo © 2011 Chris Winchell. Brewer’s spineflower (Chorizanthe breweri) inflorescence, July 4, 2011. Photo © 2011 Chris Winchell. This fact sheet was prepared by Dylan M. Neubauer under award NA04N0S4200074 from the National Oceanic and Atmospheric Administration (NOAA), U.S. Department of Commerce (DOC). The statements, findings, conclusions, and recommendations are those of the authors and do not necessarily reflect the views of the NOAA or the DOC. Brewer’s spineflower occurs in grassland, chaparral, oak-pine woodland, or closed-cone coniferous forest; in gravel or rocky places on serpentine outcrops; 45-800 m (Goodman 1934, Reveal and Rosatti 2014, CNPS 2015, CNDDB 2018, Keil unpublished). Plants annual, decumbent to ascending, to 2 dm, thinly pubescent. Inforescences mostly flat-topped, bracts 2, opposite, awns straight; involucre 3-angled, 6-ribbed, teeth 6, abaxial longest, awns 0.3–1 mm long, hooked. 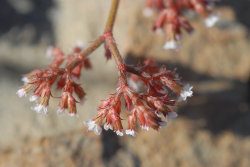 Flower hairy; perianth white to rose or red, lobes entire, not alike, inner narrower and shorter; stamens 9. n=19 (Reveal and Rosatti 2014, Keil unpublished). Brewer’s spineflower is infrequent from the southern Santa Lucia Range to the San Luis Range (Keil unpublished) in the outer South Coast Ranges (SCoRO) of San Luis Obispo County, California (Reveal 2005, Reveal and Rosatti 2014). Brewer’s spineflower was described by Sereno Watson (1) in 1877, from an April 1861 William H. Brewer (2) specimen (No. 456) collected on “dry, rocky hillsides” in San Luis Obispo. Watson erroneously placed it “near C. pungens because the teeth were ‘united at base by an inconspicuous margin’” (Goodman 1934). Willis L. Jepson (3), in his 1909 Flora of California, stated that the species was “[i]nsufficiently known and perhaps only a variety” of Chorizanthe staticoides. The CNDDB (2018) reports 45 extant occurrences of Brewer’s spineflower that fall within ca. ten USGS 7.5’ quads in San Luis Obispo County. One of these occurrences straddles the San Luis Obispo County/Monterey County border in northwestern San Luis Obispo County. Most occurrences are centered in and around the city of San Luis Obispo, with ownerships including the City of San Luis Obispo (at Laguna Lake) (where Brewer’s spineflower occurs with other rare species including Chorizanthe palmeri [CRPR 4.2]) and the State of California (CSU Cal Poly and Camp San Luis Obispo). Threats on city-owned properties include erosion, grazing, recreation, and development. Threats on state-owned properties include erosion, grazing, non-native species, trampling, feral pigs, and military operations. The other 14 occurrences fall on private land, with tens of thousands of plants documented. Threats include possible impacts from grazing, construction, and development. Nine occurrences have ownership unknown, in areas including Reservoir Canyon, Price Canyon, and Prefumo Canyon. These occurrences require fieldwork to document population sizes and potential threats. Seven occurrences fall on USFS Los Padres National Forest lands. Most of these occurrences have not been updated recently and require fieldwork. Some contain other rare taxa including Arctostaphylos obispoensis, Calochortus clavatus var. clavatus, Calochortus obsipoensis, Carex obispoensis, and Dudleya abramsii subsp. 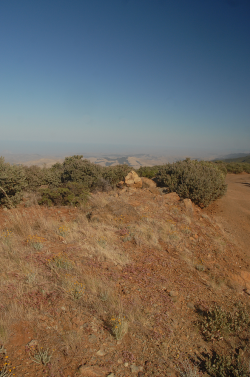 murina.The only documented threat in these areas are impacts from off-road vehicles. One occurrence on BLM land consists of thousands of plants and is threatened by trampling by cows and recreational users. The one occurrence that straddles the Monterey County line includes the length of San Carpoforo Canyon, with ownership unknown (but including Los Padres National Forest in Monterey County and perhaps the Hearst Corporation). This occurrence is based on a 1912 collection by Ira J. Condit (9) and has not been relocated. 1. Sereno Watson (1826–1892), expedition botanist of the Clarence King Expedition and later curator of the Gray Herbarium at Harvard University (Wikipedia 2018). 2. William H. Brewer (1828–1910), geologist and botanical collector the Whitney Survey of California, 1860–1864 (Goodman 1934). 3. Willis L. Jepson (1867–1946), eminent California botanist and professor of botany at UC Berkeley for four decades. 4. George J. Goodman (1904–1999), distinguished plant taxonomist, Professor Emeritus and Curator Emeritus of the Bebb Herbarium at the University of Oklahoma for 33 years (Lawson 2000). 5. “[F]rom the Greek statikos, causing to stand, and eidos, like or similar to, alluding to the similarity of this species to statice [Limonium spp.] in the Plumbaginaceae” (Reveal and Hardham 1989). 6. Section Herbaceae, “from the Latin herbaceus, of herbs,” vs. perennials, encompasses the bulk of annual Chorizanthe species in North America and is essentially restricted to those members of the genus that occur in California and Baja California (Reveal and Hardham 1989). 7. James L. Reveal (1941–2015), one of the botanical titans of the 20th and 21st centuries, specialized in Eriogonum and its relatives and published prodigiously on botanical history, nomenclature, western North American floristics, plant conservation, and Angiosperm classification. 8. Clare B. Hardham (1918–2010) was a Paso Robles botanist who collected widely in the South Coast Ranges in the 1950s and 1960s. 9. Ira J. Condit (1883–1981) was a professor of horticulture at Cal Poly San Luis Obispo (1907–1912), UC Berkeley, and UC Riverside. He was known for his work on avocados, figs, olives, persimmons, and loquats (Wikipedia 2018). California Native Plant Society (CNPS), Rare Plant Program. 2018. 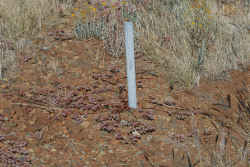 Chorizanthe breweri.Inventory of Rare and Endangered Plants(online edition, v8-02); entry last updated 23 July 2015. California Native Plant Society, Sacramento, CA. http://www.rareplants.cnps.org/detail/468.html [acc. 16 Aug 2018]. California Natural Diversity Database (CNDDB). 2018. [Internet]. California Department of Fish and Wildlife [acc. 17 May 2018]. Goodman, G. J. 1934. A revision of the North American species of the genus Chorizanthe. Annals of the Missouri Botanic Garden21:1–102. Hardham, C. B. 1989. Chromosome numbers of some annual species of Chorizantheand related genera (Polygonaceae: Eriogonoideae). Phytologia66(2):89–94. Hickman, J. C. 1993. Chorizanthe, in J. C. Hickman ed., The Jepson Manual: Higher Plants of California. University of California Press, Berkeley, CA http://ucjeps.berkeley.edu/cgi-bin/get_JM_treatment.pl?5936,5941,5943 [acc. 16 Aug 2018]. Keil, D. J. and R. F. Hoover. Unpublished. Vascular Plants of San Luis Obispo County, California, 2nd ed. Kempton, E. A. 2012. 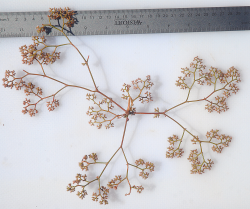 Systematics of Eriogonoideae s. s. (Polygonaceae). Systematic Botany37(3):723–737. Lawson, C. A. 2000. George Jones Goodman (1904–1999), a memoir. SIDA, Contributions to Botany19(2):415–420. Reveal, J. L. 2001. Taxonomic treatment of Eriogonoideae (Polygonaceae), Chorizanthe breweri.University of Maryland. http://plantsystematics.org/reveal/pbio/eriog/choriz/breweri.html [acc. 16 Aug 2018]. Reveal, J. L. 2005. Chorizanthe, in Flora of North America Editorial Committee, eds. 1993+, Flora of North America North of Mexico,Vol. 5. http://www.efloras.org/florataxon.aspx?flora_id=1&taxon_id=106908. Chorizanthe breweri.http://www.efloras.org/florataxon.aspx?flora_id=1&taxon_id=250060065[acc. 16 Aug 2018]. Reveal, J. L. and C. B. Hardham. 1989. 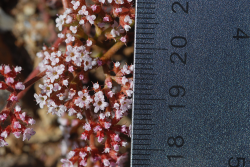 A revision of the annual species of Chorizanthe(Polygonaceae: Eriogonoideae). Phytologia66(2):137–139. Reveal, J. L. and T. J. Rosatti. 2012. Chorizanthe, in Baldwin et al. (eds. ), The Jepson Manual: Vascular Plants of California, 2nd ed. University of California Press, Berkeley, CA. Reveal, J. L. and T. J. Rosatti. 2014. Chorizanthe breweri, in Jepson Flora Project (eds. ), Jepson eFlora, Revision 2, http://ucjeps.berkeley.edu/eflora/eflora_display.php?tid=19353 [acc. 18 Aug 2018]. Tiehm, A. 1996. Nevada Vascular Plant Types and Their Collectors. Memoirs of The New York Botanical Garden77. The New York Botanical Garden, Bronx, NY. Watson, S. 1877. Chorizanthe breweri. Proceedings of the American Academy of the Arts12:270. Wikipedia. Ira J. Condit. https://en.wikipedia.org/wiki/Ira_J._Condit acc. 19 Aug 2018].